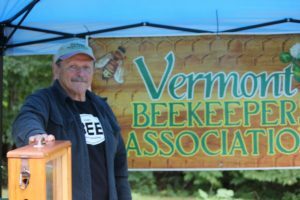 The 6th annual Vermont Golden Honey Festival was a success! Here at Golden Stage Inn, we are still buzzing about what a great day it was. On September 8, 2018, the festival was treated to a beautiful warm and sunny day with a cool breeze signifying that autumn was not far away. We had an all time high of 34 vendors. 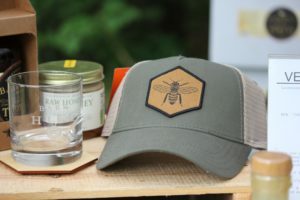 Recurring vendors brought favorites like chalk board booklets, fresh produce, bee themed pottery, and bacon soap, while new friends joined us this year, bringing with them hot fudge, honey infused chocolate, and magic wands. Aside from browsing the goodies of the variety of wonderful vendors, visitors enjoyed scavenger hunts, face painting, chainsaw carving demonstrations, and even the opportunity to participate in a Viking whipcord demonstration themselves. The Cavendish Community Library was at the festival handing out prizes and free books for the younger crowd. The festival was hopping with delicious eats, too. Honey bbq wings from the Killarney, pulled pork supplied by the Windsor Lions Club, cocktails for the 21+ crowd made by Homestyle Hostel, and of course, Goodman’s American Pie with a new take on their pizza truck; black and yellow stripes atop the pizza oven! Every year, the proceeds of the festival are donated to either a local charity or non profit. 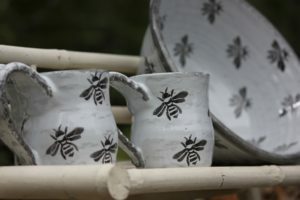 This year the festival is happily donating the proceeds to Fletcher Farm School for the Arts & Crafts to help fund a local student scholarship. This is the sixth year the festival has been held at Golden Stage Inn. It is co-hosted by the inn with Goodman’s American Pie. The mission behind the festival is multi-faceted: to promote awareness of the honeybee, to support local artisans and small business, and to provide a fun event for the community, all while making a donation to a local non-profit or charity. By these measures, the event was a great success! Goodman’s American Pie is a wood fired pizza restaurant in Ludlow, VT. They’ve been serving their fresh baked goodness for nearly 18 years now. Their beehive oven pizza truck made its debut at the first Vermont Golden Honey Festival in 2013. Their truck now makes catering appearances at private events and weddings throughout the entire state. It is only from their pizza truck that you can purchase their special pizza variety, Honey Apple pizza — Vermont cheddar, local raw honey, freshly baked apples atop their classic pizza dough. Really, how can it be anything but delicious!? Also, it is only one day per year – at the Honey Festival of course – that you will enjoy their pizza dough made with honey in the crust. Just another reason to visit Golden Stage Inn every year for the Honey Festival. Golden Stage Inn is an 8-room inn that hosts guests year round. Just ten minutes from Okemo Mountain, the inn is convenient to skiing, hiking, and all the fun of a Vermont ski town but all the peace and quiet of a rural landscape. 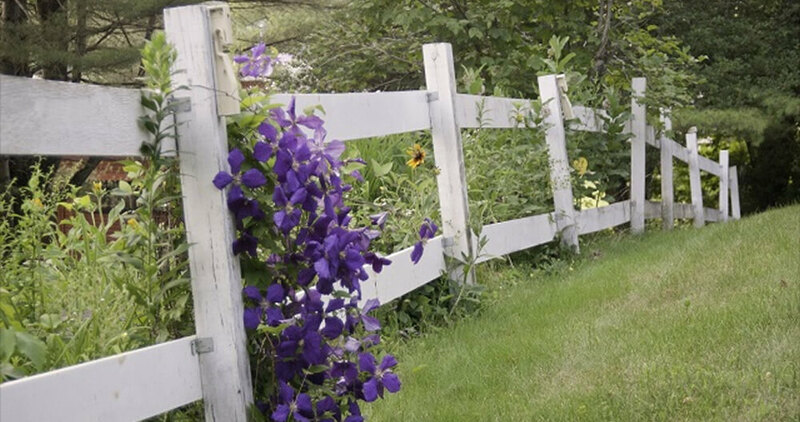 Serving fantastic breakfasts from locally sourced homemade foods, Golden Stage Inn invites you to stay for a few days and enjoy the Vermont life. This entry was posted in Arts & Entertainment, Autumn, Fletcher Farm School for the Arts and Crafts, Food & Drink, Fun For Families, General, Honeybees, Okemo Valley Events, Vermont Honey Harvest Festival by admin. Bookmark the permalink.